For other uses, see Death Star (disambiguation). The Death Star is a type of fictional mobile space station and galactic superweapon featured in the Star Wars space-opera franchise. The first Death Star, introduced in the original Star Wars film, is stated to be more than 100 km in diameter, and is crewed by an estimated 1.7 million military personnel and 400,000 droids. 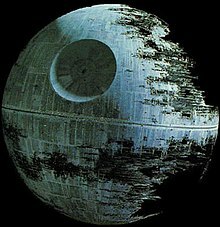 The second Death Star, which appears in Return of the Jedi is significantly larger, between 160 km to 900 km in diameter, and technologically more powerful than its predecessor. Both versions of these moon-sized fortresses are designed for massive power-projection capabilities, each capable of destroying an entire planet with a single blast from their superlasers. Able to destroy a ship, city or planet. Although details, such as the superlaser's location, shifted between different concept models during production of Star Wars, the notion of the Death Star being a large, spherical space station over 100 kilometers in diameter was consistent in all of them. George Lucas gave the original task of designing a "Death Star" to concept artist and spaceship modeler Colin Cantwell, who had collaborated with Stanley Kubrick on the 1968 film 2001: A Space Odyssey. In a 2016 interview, Cantwell related that "I didn't originally plan for the Death Star to have a trench, but when I was working with the mold, I noticed the two halves had shrunk at the point where they met across the middle." As it "would have taken a week of work just to fill and sand and refill this depression," Cantwell suggested a trench to Lucas to save the labor. Lucas liked the idea, and the Death Star model was created by John Stears. The buzzing sound counting down to the Death Star firing its superlaser comes from the Flash Gordon serials. Portraying an incomplete yet powerful space station posed a problem for Industrial Light & Magic's modelmakers for Return of the Jedi. Only the front side of the 137-centimeter model was completed, and the image was flipped horizontally for the final film. Both Death Stars were depicted by a combination of complete and sectional models and matte paintings. The Death Star explosions featured in the Special Edition of A New Hope and in Return of the Jedi are rendered with a Praxis effect, wherein a flat ring of matter erupts from the explosion. The grid plan animations shown during the Rebel briefing for the attack on the Death Star late in A New Hope were an actual computer-graphics simulation from the Jet Propulsion Laboratory made by Larry Cuba and Gary Imhoff as part of a CalArts project, and had been included during filming. After filming was complete, the original model was thrown out; however, an ILM employee salvaged it. The original Death Star was introduced in the original Star Wars film, which later had elements of its backstory explored in Attack of the Clones, Revenge of the Sith, The Clone Wars, and Rogue One. The second Death Star appears in Return of the Jedi, and a similar superweapon, the Starkiller Base, appears in The Force Awakens. Finally, wreckage from one of the first two Death Stars appears to play some role in the upcoming The Rise of Skywalker. Emperor Palpatine (left) and Darth Vader (right) watch the original Death Star's construction in Episode III: Revenge of the Sith. The original Death Star's completed form appears in Star Wars: A New Hope, known as the DS-1 Orbital Battle Station, or Project Stardust in Rogue One. Commanded by Governor Tarkin, it is the Galactic Empire's "ultimate weapon", a huge spherical battle station 160 kilometers in diameter capable of destroying a planet with one shot of its superlaser. The film opens with Princess Leia transporting the station's schematics to the Rebel Alliance to aid them in destroying the Death Star. To mark the Death Star being fully operational, Tarkin orders the Death Star to destroy Leia's home world of Alderaan in an attempt to press her into giving him the location of the secret Rebel headquarters; she gives them the location of Dantooine which housed a now-deserted Rebel base, but Tarkin has Alderaan destroyed anyway as a demonstration of the Empire's resolve. Later, Luke Skywalker, Han Solo, Chewbacca, Obi-Wan Kenobi, C-3PO, and R2-D2 are pulled aboard the station by a tractor beam, where they discover and manage to rescue Princess Leia. As they make their escape, Obi-Wan dies duelling Darth Vader, enabling the others to flee the station. Later, Luke returns as part of a fighter force to attack its only weak point: a ray-shielded particle exhaust vent leading straight from the surface directly into its reactor core. Luke was able to successfully launch his fighter's torpedoes into the vent, impacting the core and triggering a catastrophic explosion, which destroyed the station before it could use its superlaser weapon to annihilate the Rebel base on Yavin 4. The Clone Wars Legacy story reel from the unfinished Crystal Crisis on Utapau episodes revealed that the reason General Grievous was on Utapau in Revenge of the Sith was to acquire enormous kyber crystals, which were required to power the Death Star's superlaser. A hologram from the original Death Star is briefly visible in a scene at the Resistance base in Star Wars: Episode VII - The Force Awakens and used as a means of comparison with one from the First Order's own superweapon, Starkiller Base. In the animated series Star Wars Rebels, the two-part episode "Ghost of Geonosis" hinted that the Geonosians were nearly wiped out to extinction out of the Empire's need for secrecy. Saw Gerrera, having been sent to Geonosis to investigate, deduced the Empire possesses a superweapon and resolved to discover the Death Star as depicted in the final season two-parter "In the Name of the Rebellion." Though it was a dead end, finding only scientists being abducted by the Empire, Saw learned the weapon is powered by kyber crystals taken from the Jedha system. The anthology film Rogue One focuses on a band of Rebels stealing the plans for the first Death Star prior to the events of A New Hope. The Death Star project was overseen by Orson Krennic, the Director of Advanced Weapons Research for the Imperial Military. Under Krennic's supervision, the project was beset by constant delays, and he forcibly recruited weapons designer Galen Erso (the father of Jyn Erso, the movie's main protagonist) to complete the design; nevertheless, it was another fifteen years before the Death Star was operational. 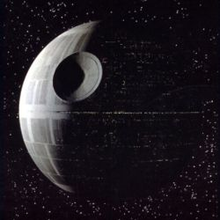 The Death Star's primary laser was powered by kyber crystals mined from the desert moon of Jedha, and is first used to destroy Jedha City both as a response to a violent insurgency on the planet, and as a display of the Death Star's operational status to restore the Empire's confidence in the project. Grand Moff Tarkin assumes control over the Death Star while Krennic investigates security breaches in the design project. It is subsequently revealed that Galen discreetly sabotaged the design by building a vulnerability into the reactor. This is the same vulnerability that Luke Skywalker takes advantage of during the events of A New Hope. After the Death Star plans are stolen from the Scarif vault, Tarkin fires the Death Star's superlaser on the base killing Krennic, as well as Jyn Erso and Cassian Andor. Rogue One also reveals that the Death Star's superlaser is powered by multiple reactors, allowing it to vary its destructive power depending on the target. Skeptical of the station's power, Tarkin ordered that it first be tested on Jedha City using a single reactor. Near the end of Rogue One, a second single-reactor test would destroy their installation on Scarif, along with the Rebel strike force who had successfully stolen the station's plans. This is consistent with the canon continuity in Star Wars: A New Hope, since the destruction of the planet Alderaan would be the first time the Death Star fired the superlaser with all reactors employed so Tarkin could declare the battlestation "fully operational". The canonical population of the first Death Star was 1.7 million military personnel, 400,000 maintenance droids, and 250,000 civilians/ associated contractors. The 2014 book Star Wars: Tarkin detailed the life of Grand Moff Tarkin, and prominently featured the first Death Star. The theme of the construction of the Death Star is continued in the 2016 book, Catalyst: A Rogue One Novel, which tells the story of the development of the Death Star's superweapon by the scientist, Galen Erso and Krennic's deception of him. It also reveals how Poggle worked with Krennic on the Project but then turned on him. Return of the Jedi features a second Death Star still under construction in orbit around the forest moon of Endor. Besides being even more massive it also fixed the flaws found in forebearer, so the Rebel Alliance's only hope is to destroy it prior to its completion. Emperor Palpatine and Darth Vader send the Rebels false information that the station's weapons systems are not yet operational in order to lure the Alliance fleet into a trap, resulting in the decisive Battle of Endor. Compared to its predecessor, the Second Death Star's superlaser is more advanced as it can be fired every few minutes instead of needing 24 hours to recharge, while improved targeting computers could track smaller targets such as capital ships. The unfinished battlestation had been protected by a planetary shield projector deployed on the forest moon of the planet Endor, however this was taken out by a ground assault team led by Han Solo with the help of the native Ewoks. Rebel pilots Wedge Antilles and Lando Calrissian, in an X-Wing and the Millennium Falcon, respectively, flew into the reactor core, with Antilles first taking out the power regulator with proton torpedoes before Calrissian struck the main reactor with concussion missiles, setting off a chain reaction that destroyed the battlestation. An early draft of the film featured two Death Stars at various stages of completion. The second Death Star is featured in the cover of the book Star Wars: Aftermath (2015), which also features many flashbacks to the destruction of the second Death Star, as well as the events directly after its destruction. One of the main characters in the story personally escaped the explosion of the Death Star. The destruction of the second Death Star was also shown in holograms in the book. The 2015 comic book Star Wars: Shattered Empire also explores the days following the destruction of the second Death Star from the perspective of Poe Dameron's parents, who were pilots during the event. The video game Star Wars: Uprising also takes place during the aftermath of the second Death Star's destruction, and features a hologram of its description on multiple occasions in and out of cutscenes. The Star Wars Rebels episode "Twilight of the Apprentice" features a forbidden planet called Malachor, home of an ancient Sith Temple. This temple contained a superweapon capable of destroying life, and could only be activated by placing a special Sith Holocron in an obelisk at the summit of the pyramid inside the temple. Thousands of years prior, a battle was waged on Malachor that resulted in the deaths of its inhabitants. Somewhere between the events of his last appearance in Solo: A Star Wars Story and this episode, Darth Maul had become stranded on Malachor. When Ahsoka Tano, Kanan and Ezra arrived, Ezra was separated from them. He was discovered by a character who later revealed himself to be Maul. Together, they solved a series of test chambers that required cooperation between two Force wielders, and retrieved a Sith Holocron. With the help of Kanan and Ahsoka, they fought three Inquisitors, all of whom were killed by Maul. Maul then betrayed his allies, blinding Kanan, and proceeded to activate the superweapon. Once Maul was defeated by a sightless Kanan, Darth Vader arrived with the intention of retrieving the holocron, but was challenged by Ahsoka Tano, his former Padawan. While the superweapon was preparing to fire, Kanan and Ezra retrieved the holocron themselves and escaped, preventing this weapon of mass destruction from being used. Even though the temple was destabilized, Ahsoka and Vader kept fighting to the death within the rapidly-crumbling building, until it eventually exploded, wounding Darth Vader and almost killing Ahsoka, who ended up being rescued by Ezra through a portal on Lothal, that he saw the battle occurring through. Star Wars: The Force Awakens features Starkiller Base, a planet converted into a superweapon built by the First Order. Significantly larger than either the first or second Death Star, and unlike either of those cost-prohibitive space stations, this superweapon cut-costs by terraforming an existing planet. The base draws its raw fire power directly from a sun via extraction through dark energy called "Quintessence" and turning it into another type of dark energy called "Phantom Energy", but it requires time to draw enough energy—this stored energy is enough to obliterate ten thousand planets. It is used and can destroy five New Republic planets within the same star system simultaneously, making it a far deadlier superweapon than the Death Star. General Hux gives an incendiary speech while Starkiller Base demonstrates its lethality by obliterating the five planets of the Hosnian Prime system (the location of the Republic government, which rotates every few years). After Rey was captured by Kylo Ren, he interrogated her within the base. Han, Chewbacca and Finn approached the base at light-speed because the Starkiller's shield kept out anything going under the speed of light. They found Rey and successfully lowered the protective shields, enabling an X-wing assault led by Poe Dameron and Nien Numb to destroy the planet-converted-superweapon, with Poe firing the crucial, destructive shots. The name Starkiller Base pays homage to the early drafts of the original Star Wars film, referring to Luke Skywalker's original surname. During early concept development, artist Doug Chiang envisioned the superweapon's gun as set inside a volcano, which X-wings would have to enter in a maneuver similar to the trench run on the Death Star in the original film. Both Death Stars and similar superweapons appear throughout the non-canonical Star Wars Legends continuity. The first Death Star was defended by thousands of turbolasers, ion cannons and laser cannons, plus a complement of seven to nine thousand TIE fighters, along with tens of thousands of support craft. It also had several massive docking bays, including dry docks capable of accommodating Star Destroyers. The first Death Star's construction is the subject of Michael Reaves and Steve Perry's novel Death Star. In LucasArts's Star Wars: Battlefront II, the player participates in a mission to secure crystals used in the Death Star's superlaser. The first Death Star under construction acts as the final stage in the video game, The Force Unleashed. Kevin J. Anderson's Jedi Academy trilogy introduces the Maw Cluster of black holes that protect a laboratory where the Death Star prototype was built (consisting of the superstructure, power core, and superlaser). National Public Radio's A New Hope adaptation portrays Leia (Ann Sachs) and Bail Organa's (Stephen Elliott) discovery of the Death Star's existence and Leia's mission to steal the space station's schematics. The first level of LucasArts' Dark Forces gives mercenary Kyle Katarn the role of stealing the plans which are subsequently given to Leia, while a mission in Battlefront II tasks the player with acting as a stormtrooper or Darth Vader in an attempt to recover the plans and capture Leia. Steve Perry's novel Shadows of the Empire describes a mission that leads to the Rebels learning of the second Death Star's existence, and that mission is playable in LucasArts' X-Wing Alliance combat flight simulator. Numerous LucasArts titles recreate the movies' attacks on the Death Stars, and the Death Star itself is a controllable weapon for the Empire in the Rebellion and Empire at War strategy game. A prototype version of the Death Star can be found in Kevin J. Anderson's novel Jedi Search (1994). The first Death Star is depicted in various sources of having a crew of 265,675, as well as 52,276 gunners, 607,360 troops, 30,984 stormtroopers, 42,782 ship support staff, and 180,216 pilots and support crew. Its hangars contain assault shuttles, blastboats, Strike cruisers, land vehicles, support ships, and 7,293 TIE fighters. It is also protected by 10,000 turbolaser batteries, 2,600 ion cannons, and at least 768 tractor beam projectors. Various sources state the first Death Star has a diameter of between 140 and 160 kilometers. There is a broader range of figures for the second Death Star's diameter, ranging from 160 to 900 kilometers. In the Legends novels Death Star, Dark Empire II, Jedi Search and Champions of the Force, an experimental Death Star prototype, DS-X (a durasteel frame surrounding a reactor core, superlaser, engines and a control room) was conceived by Grand Moff Wilhuff Tarkin as a test bed for the first Death Star. It was constructed by Bevel Lemelisk and his engineers at the Empire's secret Maw Installation. The prototype measured 120 kilometers in diameter. Its superlaser was only powerful enough to destroy a planet's core, rendering it an uninhabitable "dead planet". The targeting system on the prototype was never calibrated and the superlaser was inefficient, leaving the weapon's batteries drained. The prototype had no interior except a slave-linked control room, hyperdrive engines and other components; the station operated with skeleton-crew of 75 personnel. In the Disney attraction Star Tours: The Adventures Continue, guests can travel inside an incomplete Death Star during one of the randomized ride sequences. In the original Star Tours, a Death Star III is seen and destroyed during the ride sequence by the New Republic. Leland Chee originally created the third Death Star to explain why a Death Star is present on the Star Tours ride when both of the stations in the movies were destroyed. The station being built near the Forest Moon of Endor like the second Death Star before .It is similar to an original concept for Return of the Jedi, where two Death Stars would have been built near Had Abbadon (then the Imperial capital world). The Habitation spheres, based on the Imperials' suspicious claims that they were designed strictly for peaceful purposes, were suggested by some fans to have been the origin for the Death Star III. This was later revealed to be the case in Part 2 of the StarWars.com Blog series The Imperial Warlords: Despoilers of an Empire. In the Legends game Tiny Death Star, a random HoloNet entry states that one of the residents of the Death Star is simply staying there until he can afford to stay at the third Death Star. In the Dark Empire comic series (1991-95), the reborn Emperor Palpatine's flagships Eclipse and Eclipse II Super Star Destroyers or Star Dreadnoughts have a miniaturized version of the Death Star superlaser. The novel Children of the Jedi involves the return of Eye of Palpatine, a "colossal, asteroid-shaped" super dreadnaught constructed at the behest of Emperor Palpatine during the second year of the Galactic Civil War. The Imperials lost control of the Eye when a Jedi used the Force to hijack the main computer with their spirits. In Kevin J. Anderson's novel Darksaber (1995), Death Star designer Bevel Lemelisk is recruited by the Hutts to build a superlaser weapon. The Death Star placed ninth in a 2008 20th Century Fox poll of the most popular movie weapons. It is also referred to outside of the Star Wars context. KTCK (SportsRadio 1310 The Ticket) in Dallas were the first to use the term "Death Star" to describe the new mammoth Cowboys Stadium, now AT&T Stadium, in Arlington, Texas. The term has since spread to local media and is generally accepted as a proper nickname for the stadium. The Death Star strategy was the name Enron gave to one of their fraudulent business practices for manipulating California's energy market. AT&T Corporation's logo introduced in 1982 is informally referred to as the "Death Star". Ars Technica referred to "the AT&T Death Star" in an article criticizing a company data policy. Competitor T-Mobile mocked AT&T's "Death Star" logo and "Empire-like reputation" in a press release. The large crater (Herschel) of the Saturnian moon Mimas gives it a resemblance to the Death Star. In 1981, following the Voyager spacecraft's flight past Saturn, scientists noticed a resemblance between one of the planet's moons, Mimas, and the Death Star. Additionally, a few astronomers[who?] sometimes use the term "Death Star" to describe Nemesis, a hypothetical star postulated in 1984 to be responsible for gravitationally forcing comets and asteroids from the Oort cloud toward Earth. Kenner and AMT created a playset and a model, respectively, of the first Death Star. In 2005 and 2008, Lego released models of Death Star II and Death Star I, respectively. In 1979, Palitoy created a heavy card version of the Death Star as a playset for the vintage range of action figures in the UK, Australia and Canada. Both Death Stars are part of different Micro Machines three-packs. The Death Stars and locations in them are cards in Decipher, Inc.'s and Wizards of the Coast's Star Wars Customizable Card Game and Star Wars Trading Card Game, respectively. Hasbro released a Death Star model that transforms into a Darth Vader mech. Estes Industries released a flying model rocket version. A Death Star trinket box was also released by Royal Selangor in 2015, in conjunction with the upcoming December screening of Star Wars: The Force Awakens. In 2016, Plox released the official levitating Death Star Speaker in anticipation of the upcoming screening of Rogue One: A Star Wars Story. In 2012–13, a proposal on the White House's website urging the United States government to build a real Death Star as an economic stimulus and job creation measure gained more than 30,000 signatures, enough to qualify for an official response. The official (tongue-in-cheek) response was released in January 2013: the cost of building a real Death Star has been estimated at $850 quadrillion by the Lehigh University, or about 13,000 times the amount of mineable resources on Earth, while the International Business Times cited a Centives economics blog calculation that, at current rates of steel production, the Death Star would not be ready for more than 833,000 years. The White House response also stated "the Administration does not support blowing up planets," and questioned funding a weapon "with a fundamental flaw that can be exploited by a one-man starship" as reasons for denying the petition. The Luxembourgish magician Christian Lavey (born as Christian Kies) submitted a petition for the construction of a Death Star to the Luxemburgish parliament. However, on an interview with a local radio station Lavey admitted that this petition was just a joke and some kind of protest against the space plans of the government. ^ a b Beecroft, Simon (2010). Star Wars: Death Star Battles. London, UK: Dorling Kindersley. ^ Brandon, John (October 13, 2014). "Death Star Physics: How Much Energy Does It Take to Blow Up a Planet?". PopularMechanics.com. Retrieved November 23, 2016. ^ a b "Death Star (Behind the Scenes)". Star Wars Databank. Lucasfilm. Archived from the original on June 29, 2011. Retrieved 2007-09-08. ^ Rinzler, J. W. (2010-09-01). The Sounds of Star Wars. Chronicle Books. p. 82. ISBN 978-0-8118-7546-2. ^ a b c "Death Star II (Behind the Scenes)". Star Wars Databank. Lucasfilm. Archived from the original on June 29, 2011. Retrieved 2007-09-08. ^ "The Death Star Plans ARE in the Main Computer - StarWars.com". 11 December 2014. Retrieved 22 October 2016. ^ Sciretta, Peter (April 12, 2019). "How Did the Death Star Survive to Appear in 'Star Wars: The Rise of Skywalker'?". /Film. Retrieved April 12, 2019. ^ This space station is also called "Ultimate Weapon" by the original owner, the Separatist Confederacy. ^ Lucas, George (Director) (May 25, 1977). Star Wars: Episode IV - A New Hope (DVD) (2004 ed.). 20th Century Fox. ^ a b Lucas, George (Director) (May 16, 2002). Star Wars: Episode II – Attack of the Clones. 20th Century Fox. ^ Lucas, George (Director) (May 19, 2005). Star Wars: Episode III – Revenge of the Sith. 20th Century Fox. ^ a b Edwards, Gareth (Director) (December 16, 2016). Rogue One: A Star Wars Story. Lucasfilm. ^ Lucas, George (Director) (May 25, 1977). Star Wars: Episode IV - A New Hope. 20th Century Fox. General Tagge: If the Rebels have obtained a complete technical readout of this station, it is possible, however unlikely, that they might find a weakness and exploit it. ^ Luceno, James (November 15, 2016). Catalyst: A Rogue One Novel. Del Rey Books. ISBN 978-0-345-51149-2. ^ "Star Wars: The Clone Wars - Story Reel: A Death on Utapau - Star Wars: The Clone Wars". Retrieved 22 October 2016. ^ Abrams, J.J. (Director) (December 18, 2015). Star Wars: The Force Awakens. Lucasfilm. ^ "Rogue One Prequel Book Reveals Secret Origins of the Death Star". MovieWeb.com. 1 September 2016. Retrieved 21 September 2016. ^ Marquand, Richard (Director) (May 25, 1983). Star Wars: Episode VI - Return of the Jedi (DVD) (2004 ed.). 20th Century Fox. ^ "Malachor". Retrieved 22 October 2016. ^ "Malachor Sith temple". Retrieved 22 October 2016. ^ "Sith holocron". Retrieved 22 October 2016. ^ Goldman, Eric (30 March 2016). "Star Wars Rebels: "Twilight of the Apprentice" Review". Retrieved 22 October 2016. ^ Veekhoven, Tim (May 2, 2016). "It's the Resistance!". StarWars.com. Retrieved April 14, 2019. ^ Hawkes, Rebecca (February 18, 2016). "The Adventures Of Luke Starkiller': Peter Mayhew releases pages from his 1976 Star Wars script". The Daily Telegraph. Retrieved February 13, 2018. ^ Locker, Melissa (June 9, 2015). "Original Star Wars Script Found, Solves Long-Running Mystery". Time. Retrieved February 13, 2018. ^ Szostak, Phil (2015). The Art of 'Star Wars: The Force Awakens'. Abrams Books. p. 58. ISBN 978-1-4197-1780-2. ^ Stuever, Hank (November 11, 2007). "'I've always thought that Luke felt pretty bad for a few days after it was over. ': Good Morning, Mr. Vader! Author Michael Reaves Ponders the Death Star as a Truly Hostile Workplace". The Washington Post. Retrieved April 13, 2019. ^ Pandemic Studios (November 1, 2005). Star Wars: Battlefront II. LucasArts. Level/area: Fall of the Old Republic - 501st Journal - Mygeeto: Amongst the Ruins. What Ki-Adi-Mundi didn't know, however, was that our unit of the 501st was really after an experimental Mygeetan power source, that the Chancellor [Palpatine] wanted for his superlaser. ^ LucasArts (September 16, 2008). Star Wars: The Force Unleashed. ^ Anderson, Kevin J. (1994). Jedi Search. p. 271. ISBN 0-553-29798-8. ^ a b "Death Star (Expanded Universe)". Star Wars Databank. Lucasfilm. Retrieved 2007-08-09. ^ a b Slavicsek, Bill (1991-06-01). Death Star Technical Companion. West End Games. ^ Mack, Eric (19 February 2012). "Finally, a cost estimate for building a real Death Star". CNET. Retrieved 5 August 2013. ^ Reynolds, David (1998-10-05). Incredible Cross-Sections of Star Wars, Episodes IV, V & VI: The Ultimate Guide to Star Wars Vehicles and Spacecraft. DK Children. ISBN 0-7894-3480-6. ^ "Death Star II (Expanded Universe)". Star Wars Databank. Lucasfilm. Retrieved 2007-09-08. ^ Inside the Worlds of Star Wars, Episodes IV, V, & VI: The Complete Guide to the Incredible Locations. DK Children. 2004-08-16. ISBN 0-7566-0307-2. ^ "Convenient Daily Departures: The History of Star Tours - StarWars.com". 22 August 2013. Retrieved 22 October 2016. ^ Sophie Borland (2008-01-21). "Lightsabre wins the battle of movie weapons". London: The Daily Telegraph. Retrieved 2015-04-16. ^ "The New Death Star Stadium – Texas Stadium". theunticket.com. ^ Kranhold, Kathryn; Bryan Lee; Mitchel Benson (2002-05-07). "New Documents Show Enron Traders Manipulated California Energy Costs". Free Preview. The Wall Street Journal. Retrieved 2008-08-21. ^ Anderson, Nate (2012-08-23). "AT&T, have you no shame?". Ars Technica. Condé Nast Publications. p. 2. Retrieved 2012-08-23. ^ Morran, Chris (January 29, 2014). "T-Mobile Claims "AT&T Dismantles Death Star" In Mocking Press Release". The Consumerist. Consumer Reports. Retrieved January 29, 2014. ^ Young, Kelly (2005-02-11). "Saturn's moon is Death Star's twin". New Scientist. Retrieved 2008-08-21. Saturn's diminutive moon, Mimas, poses as the Death Star — the planet-destroying space station from the movie Star Wars — in an image recently captured by NASA's Cassini spacecraft. ^ Britt, Robert Roy (2001-04-03). "Nemesis: Does the Sun Have a 'Companion'?". Space.com. Retrieved 2008-08-21. Any one of them could be the Death Star, as Nemesis has come to be called by some. ^ "Death Star Space Station". SirStevesGuide.com Photo Gallery. Steve Sansweet. Archived from the original on 2007-10-13. Retrieved 2007-09-09. ^ "Death Star". SirStevesGuide.com Photo Gallery. Steve Sansweet. Archived from the original on 2007-10-13. Retrieved 2007-09-09. ^ "LEGO Death Star 10188 & 10143". Star Wars Cargo Bay. Lucasfilm. Archived from the original on 2007-09-09. Retrieved 2007-09-09. ^ "LEGO Star Wars Death Star Landing Bay Diorama Made from Over 30,000 Bricks". 2011-10-07. Archived from the original on October 8, 2011. Retrieved 2011-10-07. ^ "Lego Death Star – Review (Set 10188)". August 11, 2011. Retrieved 2019-02-15. ^ "Review: 10143 Death Star II - FBTB". August 25, 2005. Retrieved 2019-02-15. ^ "#X: T-16 Skyhopper, Lars Family Landspeeder, Death Star II (1996)". Star Wars Cargo Bay. Lucasfilm. Archived from the original on 2007-10-13. Retrieved 2007-09-09. ^ "#XIV: Landing Craft, Death Star, Speeder Swoop (1998)". Star Wars Cargo Bay. Lucasfilm. Archived from the original on 2007-10-13. Retrieved 2007-09-09. ^ "Star Wars TRANSFORMERS Darth Vader Death Star". Hasbro. Archived from the original on 2007-12-21. Retrieved 2008-01-05. ^ "ESTES INDUSTRIES INC. Model Rockets and Engines, #2143". Archived from the original on 2008-10-07. Retrieved 2008-08-21. ^ "Royal Selangor - Pewter - Products - Trinket Box, Death Star". Archived from the original on 2015-12-08. ^ Accessories, Ninjabox Australia | Latest Tech Gadgets &. "Official Star Wars Levitating Death Star Bluetooth Speaker by Plox". Ninjabox Australia | Latest Tech Gadgets & Accessories. Archived from the original on 2016-11-12. Retrieved 2016-11-12. ^ Roxanne Palmer (15 January 2013). "White House Rejects Death Star Petition: Doomsday Devices US Could Build Instead". International Business Times. ^ "US shoots down Death Star superlaser petition". BBC News. 2013-01-12. ^ "Luxembourg Times - Community - Petition for Luxembourg to join dark side, build Death Star". luxtimes.lu. Retrieved 2018-02-09.